The New Year’s Fireworks Season Is Here! It’s time to start planning your New Year’s Eve fireworks spectacular to ring in 2019! We have lots of information to share with you about this New Year’s fireworks season, so read on to find out about new products, order cutoff dates, and more. We are excited about several new items for the 2019 season that will be available for New Year’s. Be one of the first to shoot these great new fireworks! Some products are available to purchase now and others will arrive mid-December. Celebrate Freedom: A 42-shot, 500-gram repeater from SFX Fireworks. It features multi-layered mine effects including gold crackle and glitter with red, white, and blue stars. This is followed by comet tails to aerial breaks of gold brocades with glitter and chrysanthemum crackle. Ringing in the New Year: A 42-shot, 500-gram repeater from SFX Fireworks. It fills the sky with angled shots of red and blue with white glitter, followed by mine bursts of swirling, whistling tails with red, green, and blue stars to aerial breaks of pink, purple, and green with gold crackle. It finishes with sizzling red, green, and blue palms. Several of your favorite fireworks are on the way and should be in stock the week of December 9th. This includes Amped Up, Biggest and Brightest Assortment, Bold City, Firearm, Funky World, Jet Screamer, Mother of All Bombs, and Smokin’ Hot. Any other item not listed here and currently out of stock on our website will not be available until after New Year’s. Get in the New Year’s fireworks spirit by watching our 5-minute fireworks show, “Salute to Midnight.” We posted this show idea last year, but we finally had a chance to get out and shoot it ourselves. This display is a great example of a fast-paced, loud show to help ring in the New Year. You can read all the details about the show here. To make sure your order arrives in time for your New Year’s celebration, please order by the following cutoff dates. If you are unsure exactly where you are located on the map below, please give us a call at 904-213-0615 and we will verify your cutoff date and time based on your zip code. For additional information about shipping, please see our shipping page. Start building your New Year’s fireworks order now! 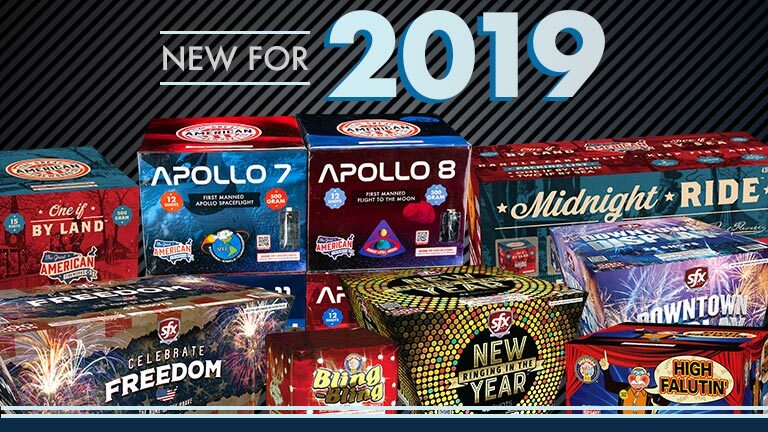 Shop our wholesale fireworks website to get first pick of our newest products, lock in your favorites, and make sure your order arrives in plenty of time to put your show together. If you’re shopping locally at our retail store in Orange Park, FL, visit our retail fireworks website to see all of our products and what’s on sale for the New Year’s season. Shop early for the best deals!